As part of Office 365 or SharePoint Server 2013, you might want to manage and stay in control with all the OneDrive for Business from your farm. Why would I need to be Site Collection Administrator on OneDrive for Business? By default, the ODFB site collection administrator is automatically given to the user when he activate his OneDrive for Business. All the users can visit their profile and see or contribute on the documents located inside the "Shared With Everyone" folder from the document library. As a farm administrator, SharePoint Administrator, or SharePoint Governance responsible, you want to be sure users use OneDrive for Business for personal and non-confidential information. You’ve got an intranet, with rules, governance, metadata and collaboration sites, and you want to be sure users are collaborating at the right place and not in their ODFB. For that, you need to have the permissions to access to the content, to be able to verify it, and to take actions if needed. If we go back to the early 2000’s, we had My Documents or My Pictures libraries on our desktop machines. It was for our personal use, but IT admin had the permissions to see the content. We just want to do exactly the same with the OneDrive for Business. The most basic move is to change the Site Collection administrator directly from the central administration for every single user. Connect to the central administration, then select "Change Site Collection Administrator" from the "Application Management" menu. You can find them easily because the URL always contains my/personal. On my virtual machine, I can see them on the top of the list when I click on "Change Site Collection". In Office 365, you first need to connect to your SharePoint administration, then select the "Manage User Profiles" option from the "User Profiles" menu. Then, you can search the users who have activated their profile using the find option. You need to know their name to be able to search. There’s no complete list where you can see all of them. Once you have a user profile, you will find a tiny little arrow that allows you to manage Site Collection owners. Similarly to On-Premises, you can change primary and secondary administrator. And then you have to repeat the same operation for all user profiles. Inside the Find option, you just have to select the OneDrive for Business Object and click on next. There’s no need for me to add filters or columns for our mission. Then select your target. You can select more than one farm. Here in my screen, I have my On-Prem SharePoint 2013 and an Office 365 environment. If both of them are connected to the same Active Directory you’ll be able to add an administrator in one step. For 2 AD’s, you'll need two actions. From the result page, you can see all the OneDrive for Business activated by a user. Select them and click Edit. Choose the Add Administrator option inside the menu and select user. Then click on apply! That’s it! In one step you’ve added yourself as administrator to all of the ODFB. Save time... LOTS of time! Imagine the time you can save by not adding your users manually. I love the old adage that says: "If you have to do it twice automate it"! We've lined the two against each other: The built-in SharePoint central administration VS Sharegate Management tool. Sharegate provides a simple way of changing user roles in SharePoint and Office 365. No need for heavy PowerShell machinery, do it in bulk in under a minute. I’ve added my user to 4 user profiles on O365 in 1m48s. It would take you at least 45 minutes for 100 users. For the exact same number of users, it would take me only 1 minute with Sharegate. Sharegate has been built to simplify your day to day administration tasks. By allowing you to edit multiple objects at the same time, you can save a lot of time! This use case is one of many that the tool allows you to do. As we demonstrated, you can create custom reports to perform desired actions, or you can pick one fitting your needs from the built-in ones. 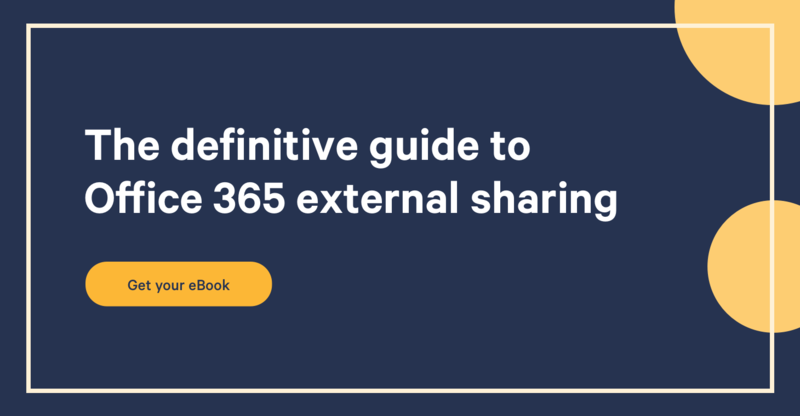 For example, find and manage every external users with access to your Office 365. You'd be surprised of the potential security leaks they may represent. Now that you have administrator rights on OneDrive for Business, you can manage and control the content. How cool is that! So tell me, how many OneDrive for Business do you manage?